Buying a house or apartment, paying a mortgage, maintaining your home: these are common concerns of property-owners in the modern world and most people turn to banks to finance their real estate ventures. But what if you’re an ancient Mesopotamian priest with the god’s house—that is, a temple—to run? Here, the funding agency is not your bank but rather your king, and you’ll need to make quite a persuasive case to get his attention. Temples in ancient Mesopotamia (modern-day Iraq) were not only religious spaces: they controlled property and slaves, acted in legal cases, and stored money and precious goods in their inner sanctums. Even with these riches, upkeep was expensive and required additional resources as temples needed renovations and particular accessories for the performance of routine rituals, especially for larger festivals such as for the New Year. So, the king was in charge of reconstruction projects and he and other elites often made donations to the main temples, which also benefitted from royal exemptions from taxation and from other means of support such as receiving spoils of the king’s military campaigns. 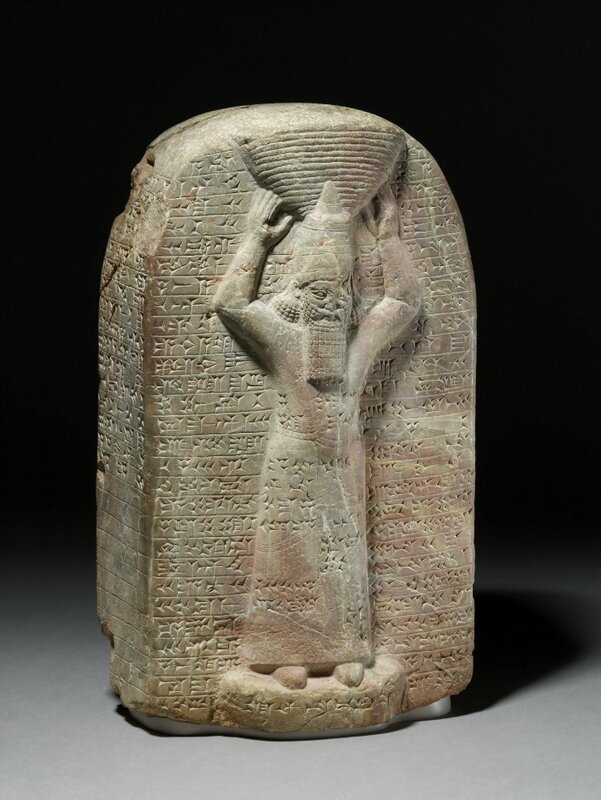 A stele from Babylonia showing King Ashurbanipal (687-c. 627 BCE) performing the “basket bearing” ritual to mark the start of temple construction. British Museum 90865. But not all temples were so lucky when it came to royal patronage; wealth was generally concentrated in the major temples, the ones that were most important to royal ideology. Peripheral and provincial temples were not necessarily as financially stable and may have struggled with maintaining the building, keeping the rituals running, and paying the officials and staff. A temple in this situation was best served by trying to attract the attention of the king so that he would support their cult. So how did local priests try to convince the king to grant them privileges and financial assistance? The answer was by invoking ancient history—or something like it. 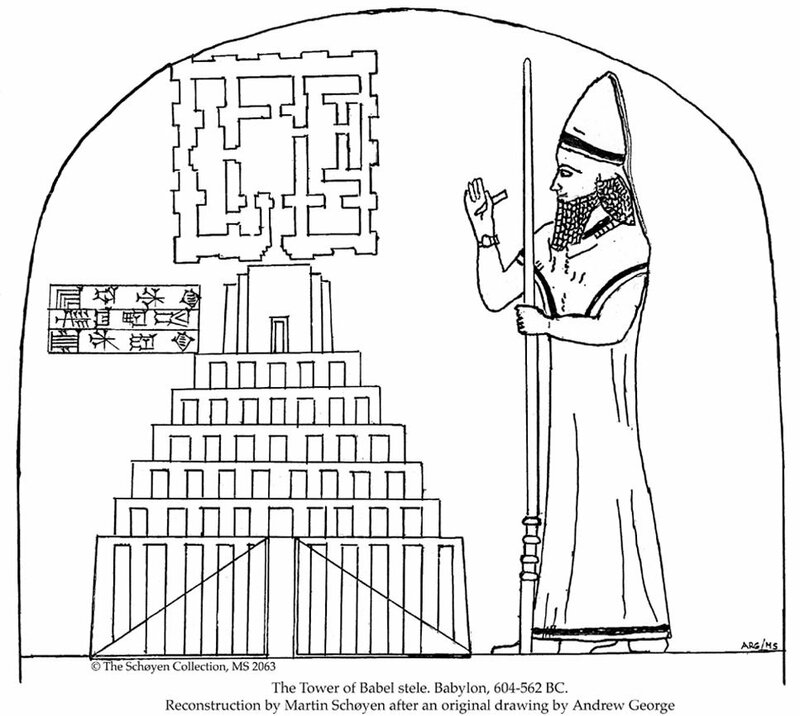 Stele from Babylon showing a ziggurat and the temple at its top. Source. For example, the priests of the Sippar temple of the sun god, Šamaš, got quite creative. 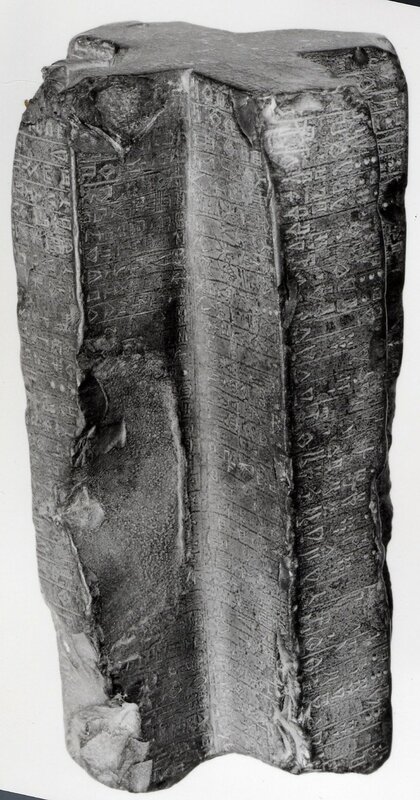 At some point, probably the Neo-Babylonian period (626-539 BCE), the priests approached the king with an impressive inscription, the Cruciform Monument, that was written in an antique form of Akkadian and explained privileges and funds granted to their temple by the third millennium king Maništušu. The monument claims that the temple received land, renovations, provisions for the priestesses and temple, mandated labor from 38 cities, and gifts for Šamaš and his consort Aya. This was an effective strategy—kings paid careful attention to the deeds of ancient predecessors, especially construction projects and granting privileges, often to outdo them and receive divine favor. Thus, the appeal for the king to follow in Maništušu’s footprints was strong. Cruciform Monument, British Museum 91022. Source. There was, of course, one tiny detail that king, who was probably illiterate, wasn’t aware of—the monument was not ancient at all! 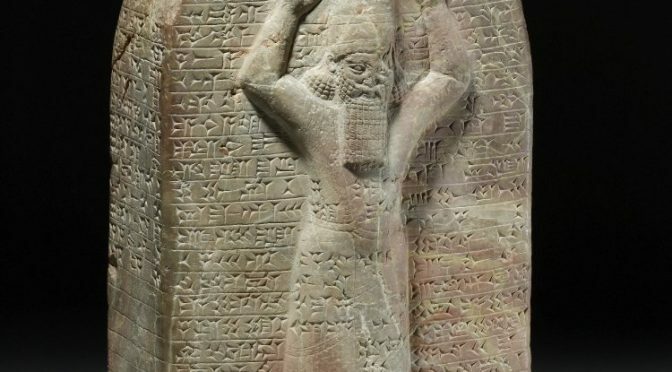 The Sippar priests created the text themselves, imitating the ancient script and language of Old Akkadian to convince the king to provide support. They didn’t quite get the Old Akkadian right and perhaps went a bit too far in ending the text with “this is no lie, it is the truth.” It is unknown whether the king saw through their ruse or if the priests were successful, but the fact that this monument exists shows the importance of texts and ancient theological ideals. This is not our only example of “pious frauds,” which usually had to do with temple privileges in a similar way as this case, so it’s clear that this was not an isolated incident. Later, in Seleucid period Uruk (312-63 BCE), the local elites took an even more elaborate approach to promote their temples. 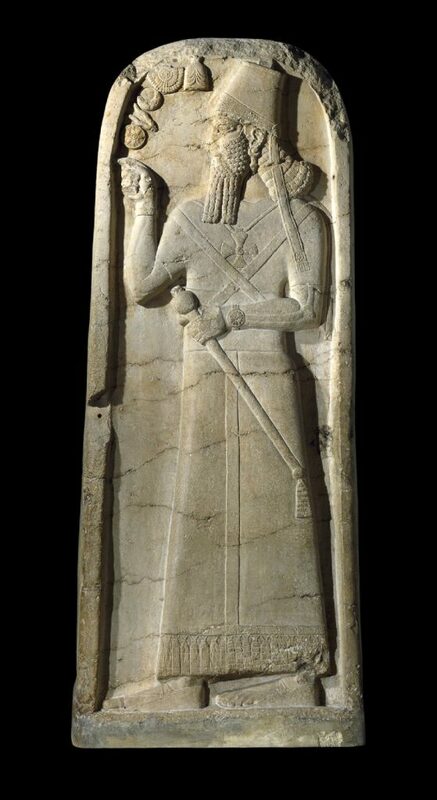 Uruk had a long history of being the main cult center in southern Mesopotamia as the home of Ištar (called Inanna in earlier periods) and Anu (earlier, An). But, the city was overshadowed by the rise of Babylon and its city god Marduk in the Old Babylonian period (c. 2000-1600 BCE). When Babylon’s status later declined, Uruk’s literate elites took the power vacuum as an opportunity for a religious reform that would put Uruk back on the cultic map. Marduk of Babylon depicted on a Babylonian cylinder seal. Source. 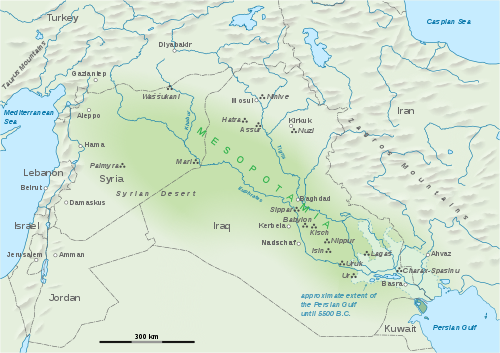 Map of Mesopotamia, including the Babylonian cities of Sippar, Uruk, Babylon, and Nippur. Source. Even though Uruk had become marginal, Ištar remained one of the most popular deities throughout Mesopotamia’s history, especially in royal ideology. But the reform did not promote Uruk’s Ištar cult—no, strangely enough, the Urukean elites revived the cult of Anu, the god of the heavens, who did not have the same popularity despite historically being the highest god in the pantheon. The exact timeline is not clear, but by the Seleucid period, Anu’s dominance in Uruk was indisputable and rising. Local archives show how the scribes promoted Anu from a local god to a universal god through ancient texts that recognized him as the head of the pantheon, sometimes reinterpreting the texts to prove their theological ideals. 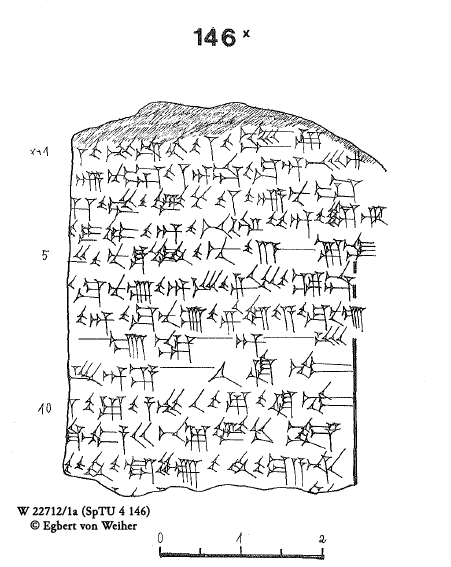 Example of an Akkadian text that exalts Anu found in Seleucid period Uruk (312-63 BCE). Full edition. Why did the Urukeans revive a long-defunct cult instead of capitalizing on their powerful and popular local goddess? Like the Šamaš priests in Sippar, the answer lies in strategic antiquarianism and the tendency in ancient Mesopotamia to repackage theological innovations as a return to ancient traditions. Anu’s status as the traditional head of the pantheon meant that his relative unimportance in living cult mattered less than the fact that he outranked all other gods. Most importantly, he outranked Marduk of Babylon and even Enlil of Nippur, another rival cult city in Babylonia. A governor of Uruk even created an ancient past for the (new) temple complex built for Anu by claiming that it was actually built by a legendary sage who was said to have lived before the Great Flood. Reconstruction of the Bīt Reš, the Seleucid period temple complex of Anu and his consort Antu (image by Staatliche Museen zu Berlin/Deutsches Archäologisches Institut). Source. Unfortunately, we don’t know how these reforms played out regionally or to what extent non-literate classes knew about them. We are left to wonder if the Urukeans managed to draw the king’s attention to their ancient and powerful (if somewhat neglected) god Anu and thereby to channel imperial wealth and resources into their city. 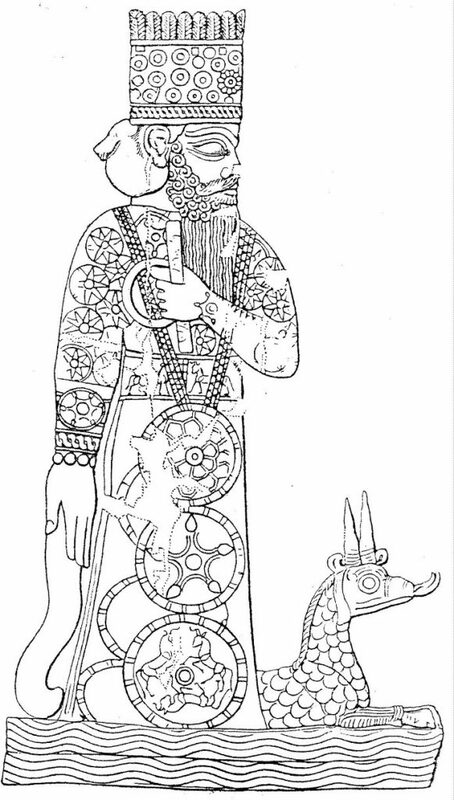 Šamši-Adad V of Assyria (c. 815 BCE) shown facing the symbols of the gods. The horned crown representing Anu is the highest in the sequence (British Museum 118892). Source. P.-A. Beaulieu, “Antiquarian Theology in Seleucid Uruk,” Acta Sumerologica Japonica, vol. 14 (1992): 47-75. A. Berlejung. 2009. 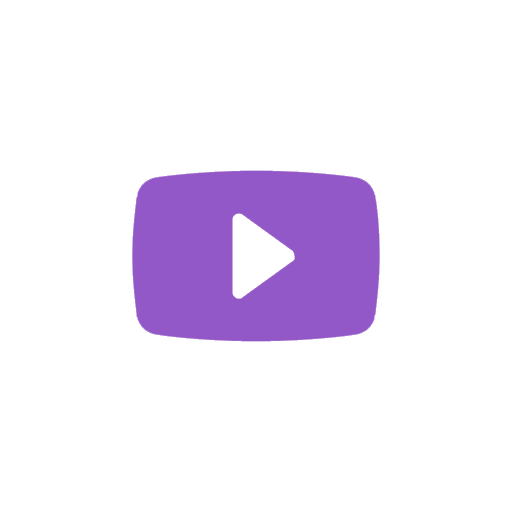 “Innovation als Restauration in Uruk und Jehud. Überlegungen zu Transformationsprozessen in vorderorientalischen Gesellschaften” in Reformen im Alten Orient und der Antike. Programme, Darstellungen und Deutungen, ed. E. – J. Waschke. Mohr Siebeck. N. Na’aman. “The ‘Discovered book’ and the Legitimation of Josiah’s Reform.” Journal of Biblical Literature 130: 1 (2011): 47-62.